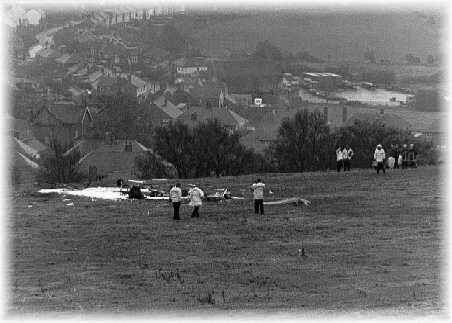 On Tuesday the 20th October 1998, the entire village and surrounding area of Mow Cop was shocked to hear that a small airplane had crashed in one the fields directly below the Castle. The two-seated Slingsby Firefly, had been circling for a small while before crashing into an unrecognisable heap in a field, it is though to have been landing in. The plane had left the civilian flying school and was being flown by two experienced pilots. The instructor was Benoit Charles Niclause aged 39; he was the Chief Test Pilot at the "Test Pilot School" in Woodford, Stockport. The second pilot was the pupil; Francisco Bueno Cabellero aged 36, a pilot with 15 years experience. He was based in Torrijon De Ardoz, Madrid. The plane had crashed on a clear day; presumably they had been having problems as local school children at Castle Primary had been playing outside and had seen a small plane circling, and then disappear. This small disaster could have been much worse, not on the scale of Lockerbie perhaps, but definitely with a lot more fatalities. This was definitely averted by the bravery and skill of the two pilots both of whom died. On Saturday the 20th October a memorial service was held at St.Thomas' Church, and a small memorial garden unveiled at the site of the crash. The service was presided over by the Rev. Jill Waters of St.Thomas' Church and The Rev. Stephen Hatcher form the Methodist Church, Mow Cop. Also in attendance were the relatives of Benoit Charles Niclause and the representatives of the test pilot school (now in Coventry). The Lord Mayor of Kidsgrove Mr. Geoff Hall and the Lady Mayores Mrs. Doris Hall were among the 40 or so well wishers.